← One for the researchers: The Lloyd family. Well, it wasn’t so easy. The only evidence I can find is on the 1930 second-epoch based 1:2,500 issue. It’s a good find, but not conclusive, but decent enough to go exploring with a GPS. Here’s what I found. 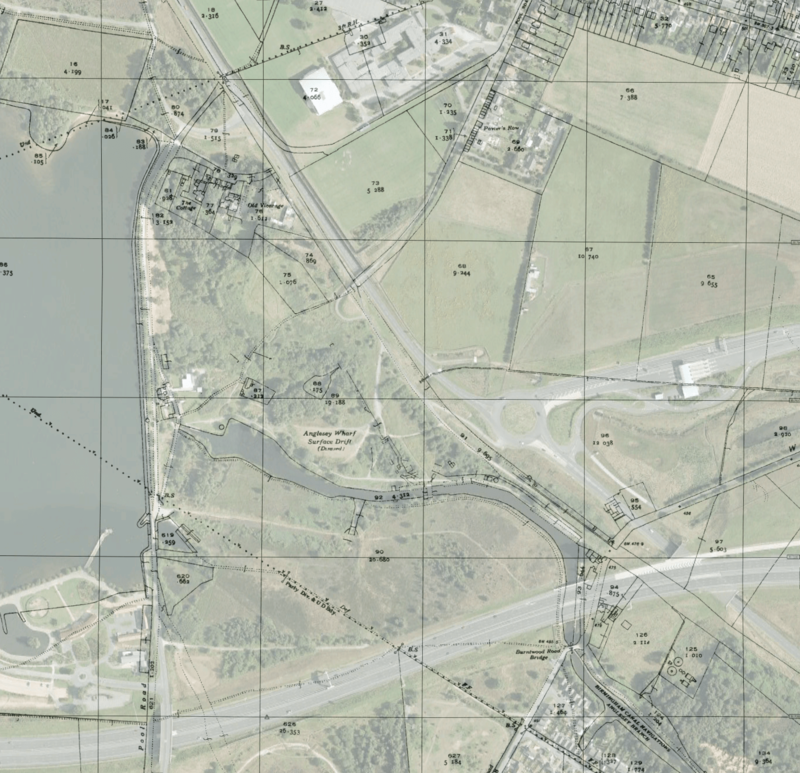 A Google Earth overlay of the map can be downloaded at the link below. This can be used in Google Earth itself, or as a basemap in modern Garmin GPS units – find out how, here. 1938 1:2,500 Anglesey Wharf Overlay – hosted at Box. 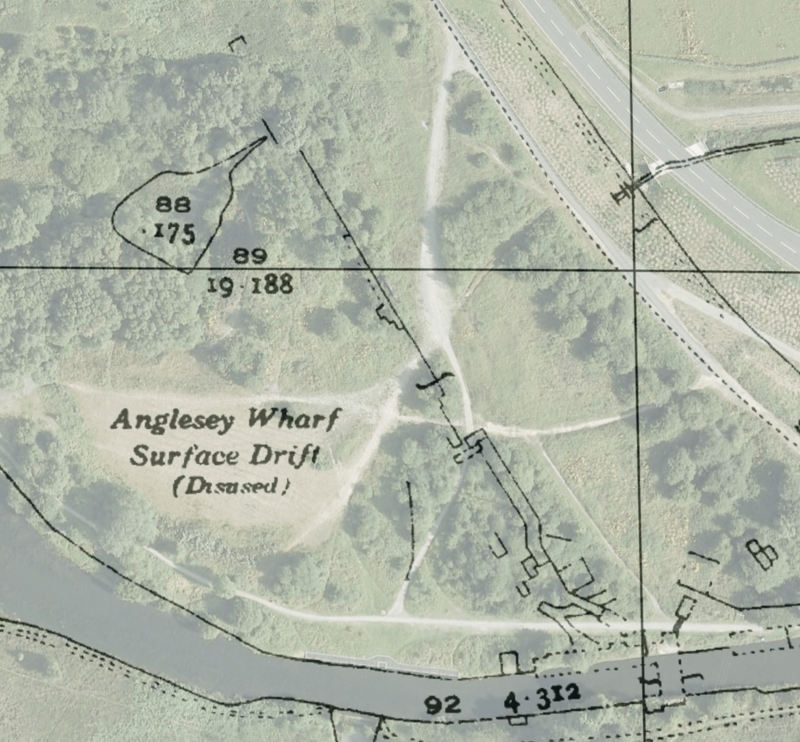 1938 1:2,500 ordnance survey plot of Anglesey Wharf. This is the only one I can find that explicitly labels the drift shaft – interestingly as ‘Disused’. Click for a larger version. The logical thing to do was overlay the above map onto Google Earth. Note the line of the line into the shaft – broadly speaking northwest – would take it through the Rugby Club’s pitch, which is where the shaft of Cannock Chase No. 2 Colliery was sunk. Click for a larger version. Here’s a zoom on the drift shaft detail. I think the ‘portal’ the men were seen sitting on in the image below is upper left of centre. Note that as Dave Fellows says, you can see remnants of the wall in the scrub. Click for a larger version. Dave Fellows’ great picture of the drift shaft portal in 1921. Unsure of actual source. 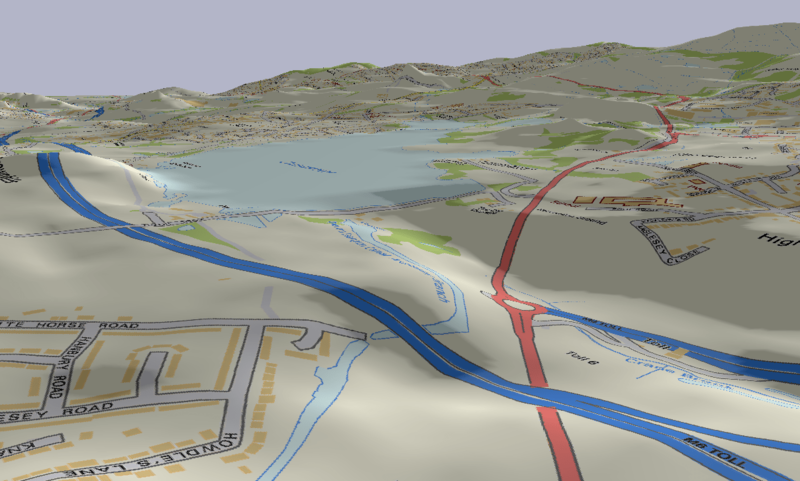 This imagery – based on Ordnance Survey Streetview mapping stretched to a five-times amplified version of the landscape contours indicates the reason for the position and type of shaft. From the bank of the Crane Brook valley, there was a very acceptable angle which would already have negated much of the depth of No. 2 Colliery on higher ground in the distance. Click for a larger version. This entry was posted in Brownhills stuff, Chasewater, Environment, Followups, Fun stuff to see and do, Interesting photos, Local History, Local media, News, Reader enquiries, Shared media, Shared memories, Social Media, Spotted whilst browsing the web, Walsall community and tagged Adit, Anglesey Wharf, Brownhills, Brownhills local history, Brownhills Past, Canal, Chasewater, Chasewater Dam, Coal Mining, Conveyor, Cycle rides, Derelict, drift shaft, Local History, Narrowboats, Old maps, Ordnance Survey, Redevelopment, Reservoir, Staffordshire, Wildlife. Bookmark the permalink. “The first of these improvements came in the form of an inclined ropeway which opened on 16th April 1923. It ran from the main haulage way at the bottom of No.2 pit, which then ceased as a drawing pit, a depth of about 200ft to the suface near the terminus of the Anglesey branch canal., a distance of about one mile. 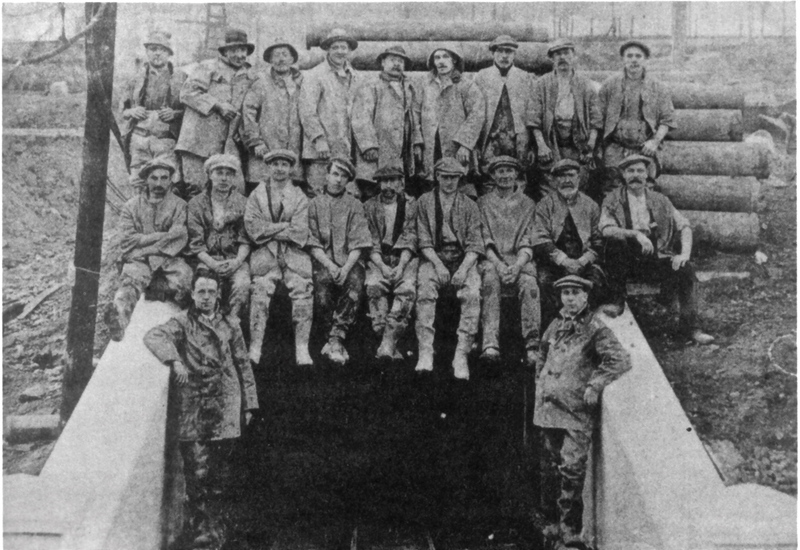 It took a party of miners two years to complete, hand hewing and working three shifts a day. The tubs were attached to a continous haulage rope running on surface rollers powered by a 120hp engine. Still can’t find any more info on the conveyors, must have been a fair bit of work and expense involved in building and operating them, but they barely rate a mention. The wall is still partly there and from that the drift can be surmised. I’ll send some pics later.